blurred used to be about mountain bikes... however, like me in the last few years, it's evolved and is now becoming a place of ideas and observations. Creative writing, curated writing, photography, ideas for disruption and creativity. The 2015 Crankworx Fox Air DH each year takes over the A-Line, one of the most well-know trails in Whistler. Then it adds in a list of riders from you'd not normally see on the regualr starting list for a UCI World Cup Downhill event... alongside the downhillers, you'll find enduro racers, freeriders, slopestyers and locals just happy the ride in front of an audience... so with such a variety, you'll find a variety of styles and ambitions from entertain to win! 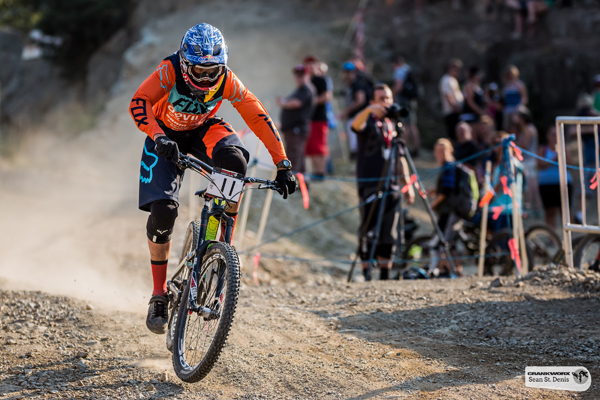 For the 2015 Crankworx Fox Air DH, victory in the men's event went to Steve Smith, after a year dogged by injury, it was well deserved. While Jill Kintner secured the women's event. SRAM presents the Zero To Sixty series in partnership with Mind Spark Cinema as part of the 2015 Crankworx Whistler Fox Air DH event, featuring, Dean Lucas, Matt Walker, Steve Smith and others.